This weekend coincides very closely with two important anniversaries of St Pio of Pietralcina, the saint who ministered for so many years at San Giovanni Rotondo. It was almost exactly 100 years ago on September 20th 1918 that Padre Pio had the first signs of the stigmata. And exactly fifty years ago on September 23rd 1968, the saint was called to God after a life of suffering, some rejection and huge dedication to ministry. The holy man would be glad to point us to the readings that the Church puts before us today. It can be easy to let saints recede into the distant past and become increasingly idealised. But Padre Pio was a saint who lived most of his life in the 20th century and who experienced the awful slaughters of the two World Wars that convulsed the world and especially Europe. He knew bad health and the reality of human sin. And he bore the crosses of others' pains in his own body. So he could identify with the author of our first reading who is criticised and attacked. He shared the ability of St James in our second reading to talk an uncomplicated and honest language. And, like Jesus in the Gospel. He was not afraid to challenge - and even shock – people. The saint of San Giovanni Rotondo was no plaster cast fairy godfather with magical powers. Like Jesus, all he wanted to reveal was the mercy of God. He knew that only the often uncomfortable truth would set people free. Just as Jesus sought to reveal God by being 'the face of the Father's mercy', so Padre Pio did not want to offer himself but only to point to God. Anyone who is stuck at Padre Pio the possible miracle worker has missed the point and does not know the real St Pio. The saint was much more concerned about the power of God's grace, than about the power of his mitt. Those who want to be healed only in body have missed the point of St Pio's life and mission. If the relics are not understood as pointers to the saving death of Christ on the Cross for sin, then some people have not heard Padre Pio or today's Gospel. Popularity because of fancy miracles was one of the Temptations that were placed in front of Jesus in the Gospel. Get behind me, Satan, was Jesus' response to Peter's declaration last week that Jesus could not suffer and die. Competition about who is the greatest is condemned by Jesus today. The greatest enemy of St Pio is not sin in somebody out there. His greatest threat comes from those who stop at the saint and fail to encounter the One to whom he was always pointing, even with the stigmata that he bore. Sin will be overcome by the Cross of Jesus, not by magic. It is interesting that, in the healing miracles of Jesus, that Jesus so often says something like 'Your faith has healed you.' Miracles in St John's Gospel are always referred to as 'signs'. They are signs that point to the victory of grace and healing over sin and death. They call individuals to acknowledge the power of God. The cripple who was let down through the roof was first told that his sins were forgiven. Healing takes place not just in bodies but also in our relationships with ourselves, with others and with God. The Kingdom of God is concerned with helping people know the loving Father. So one of the agents of renewal in the Church is the rediscovery of the Sacrament of Reconciliation. 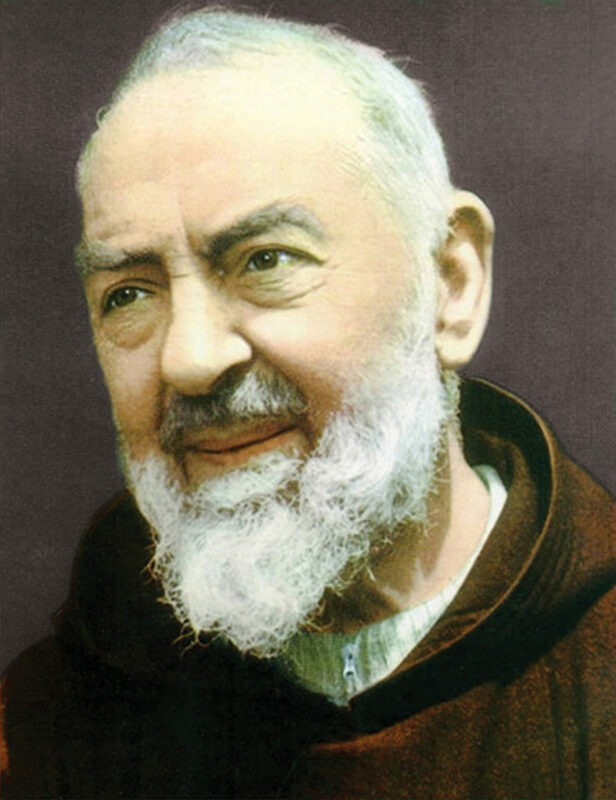 Padre Pio had the first signs of the Stigmata while hearing Confessions. But many do not want to hear talk of sin – like those in our first readings. If we reduce right merely to what i feel is right, then I become God, deciding between good and evil. Thus, St James in our second reading, keeps pointing us away from seeing the devil out there back to recognising our own capacity for blindness and evil. A recent author speaks of the doctrine of Original Sin as something that 'democratises' sin. Evil is not merely out in there in someone who does terribly wrong. It is in all of us and all of our institutions. And recognition of sin in ourselves is not a bad thing. It is not a question of loading guilt on people. What Padre Pio was keen to emphasise was that sin is real – but that the grace of Jesus can free us from it. We are not imprisoned by what has happened in the past. We can be proud of being forgiven sinners. We can boast of God's goodness and grace – as we don't have to convince people that we are perfect. God's forgiveness, readily available, is our biggest boast. The Samaritan woman, Peter the betrayer, St Paul and so many others had no problem in admitting their guilt. Indeed, their only message was that forgiveness was so readily available for everybody and for everything. All we have to do is to acknowledge that need. That was why the Mass was so important to Padre Pio. The Mass is a re-presentation of the sacrifice of Calvary. Jesus, at the Last Supper said that the Passover meal would no longer be celebrated in memory of the Lamb that saved the people before they left Egypt. His followers would now "do this in memory of me." As St Paul tells us, when we eat this bread and drink this cup we proclaim the Lord's death until he comes again. (Cf 1 Cor 11:26) In the Eucharist, the power of Christ's death is made present – and we are invited to be partakers in it. The Eucharist is not some sort of static presence of Jesus, sitting in the Tabernacle. The Tabernacle sacramentally prolongs the presence among us of the Calvary event that we celebrate at Mass. Padre Pio knew that. He would ask us not to forget it. We remember saints, not because they are perfect superheroes. We remember them because, in their ordinary flawed lives, something of the extraordinary was revealed through the grace of God. Padre Pio would ask us, not to remember him, but to remember what Jesus was saying to us through him. Saints are not statues that we look at. They are more like stained glass windows through which the light of God's grace can shine.This weekend, we have heard readings that Padre Pio knew well because he had to live with misunderstanding, the horrible reality of sin (especially against little ones), people who were hungry for power and those who wanted grace without the Cross. He asks us, not to be like him for we do not live in his time. He asks us to be saints in our time, not to be scared by the reality of sin and not to be scared of acknowledging sin. He would ask us to love the Eucharist and to cherish the Sacrament of Reconciliation. And then we, too, can pray, hope and not worry.